Following an illness lasting several months, Christopher Hogwood died peacefully on Wednesday today, a fortnight after his 73rd birthday. He was at home in Cambridge, UK, with family. The BBC tells us in a fine tribute [here] that Hogwood worked with many leading orchestras around the world and was considered one of the most influential exponents of the early-music movement. He famously founded the Academy of Ancient Music (AAM) in 1973, directing it across six continents for some 30 years. The AAM also made more than 200 CDs, including the first-ever complete cycle of Mozart symphonies on period instruments. 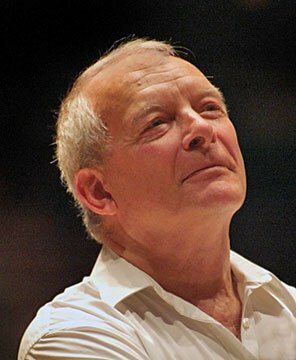 “Chris Hogwood was a wonderful colleague, and many of us will miss his earthly presence,” Hogwood’s former concertmaster Dan Stepner told BMInt. By completing its evolution in 1989 into an exclusively period-instrument orchestra and chorus, Hogwood ushered in a new and exciting chapter in the history of this 200-year-old organization. His 15-year tenure abounds with great artistic successes, from a splendid collaboration with the Mark Morris Dance Group in a production of Gluck’s Orfeo ed Euridice, which toured to the Edinburgh Festival and elsewhere, to unique jazz partnerships with the Dave Brubeck Ensemble, Chick Corea, and the Marian McPartland Trio, among others. Born in Nottingham, England on September 10, 1941, Christopher Jarvis Haley Hogwood studied music and classical literature at Pembroke College, Cambridge. His early music influences included conductor and harpsichordist Raymond Leppard and musicologist and harpsichordist Thurston Dart. Dart inspired David Munrow and Hogwood who became the founders of the Early Music Consort of London in 1967. Hogwood then revived the Academy of Ancient Music, a group originally begun in 1726, to study the “old” music of its day. Under Hogwood’s direction, the “new” Academy of Ancient Music performed and recorded on period instruments. He was first approached by the Handel and Haydn Society in 1985 and became its Artistic Director in 1986. Hogwood began his tenure with a powerful first impression: a Mozart weekend, centered on the Requiem, followed by H+H’s first period-instrument Messiah and a spring full of Bach, Handel, Mozart, Purcell, and Haydn. During his tenure, Boston also heard Handel operas (Giulio Cesare, Semele, Acis and Galatea, and, later, Ariodante) and in 1999, the world premiere of Dan Welcher’s JFK: The Voice of Peace, narrated by David McCullough, which had been commissioned by H+H. After leaving the Handel and Haydn Society in 2001, Hogwood became Emeritus Director of the Academy of Ancient Music, the orchestra he founded in 1973, during the 2007–2008 Season. In addition to his close association with the Kammerorchester Basel, Hogwood was also a regular guest with the Tonhalle Zurich, Frankfurt Radio Symphony Orchestra, and Athens Camerata. A prolific musician, he made over 250 recordings, including the first-ever complete Mozart symphonies on period instruments. A writer and musicologist, Hogwood also edited the music of Mendelssohn and C.P.E. Bach. He was the chair of the editorial board of C.P.E. Bach: The Complete Works, which is published by the Packard Humanities Institute. Hogwood’s personal volumes include Handel: Water Music and Music for the Royal Fireworks (Cambridge University Press), published in 2005. Dan Stepner continues, “We continued to be connected through email, and even more so through his scholarly pursuits and publications in recent years. During his tenure at the helm of the Handel and Haydn Society he proved courageously adventuresome with repertoire in a way that stimulated us in the orchestra and chorus, as well as the audience. Always interested in the byways of baroque and classic era music, he also led memorable performances of better-known masterpieces. I remember particularly a moving B Minor Mass of Bach’s that he led, as well as Bach’s lesser-known Lutheran Masses. Among my cherished memories, are Chris’s rendering of Beethoven C Major Mass, Cherubini’s Medea (narrated by Claire Bloom), and Mendelssohn’s overture from The Uncle from Boston — not to mention three of Mendelssohn’s masterworks: Elijah, the original version of his Italian Symphony, as well as Mendelssohn’s epoch-making version of Bach’s Saint Matthew Passion. Chris’s splendid Vivaldi Weekend marathon put the composer into new relief for me, and the Mozart Weekend, with the multiple completions of the unfinished Lachrimosa and other rarely heard fragments, was a revelation. Chris had a special affinity for Mozart; it was wonderful to play Mozart’s concerti with him, both as soloist and orchestral player. His collaborations with Dave Brubeck and others jazz greats were natural outcomes of his interest in improvisation and communication across the centuries. As a conductor, Chris was energetic, helpful, unostentatious and gracious. He was always collegial in that role, but firmly in command. His performing was always about the music. With a recent publication, Chris left us violinists an invaluable compilation of Corelli ornamentation by numerous 18th-century violinists. For music-lovers he left a wonderfully balanced biography of Handel. His commentary and writing in general had a modern perspective, even as it was grounded in thorough scholarship. H+H will dedicate the performances of Mendelssohn’s Elijah, to be conducted by former Music Director Grant Llewelyn on March 6th and 8th, 2015 at Symphony Hall, to Christopher Hogwood. Having missed it in 2000, I for one had been very much looking forward to Christopher Hogwood’s performance of Elijah scheduled for this spring. In many ways Mendelssohn became Britain’s own; who better than Hogwood to reveal him to us?